This subject comprises the vast majority of our collection, not all of which is on display here. Freemasonry has a rich and complex history. It is not known where or when Freemasonry began although most historians and scholars believe it was in the British Isles sometime during the 1500s. In 1717, four lodges came together in London to form the first Grand Lodge, the start of the the modern era of Freemasonry. The second Grand Lodge was formed in Ireland and although there are no records from this time, they celebrate their anniversary from 1725. In 1733, the third Grand Lodge in the world was formed in Massachusetts and it’s from there that Freemasonry came to the ‘District of Maine’ with the first lodge being formed in Falmouth (now Portland) in 1762. Freemasonry is now world-wide with lodges in every free and independent country. As a result, every book written looks at the organization from a slightly different perspective. 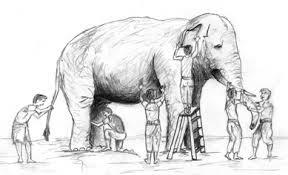 It is, in many ways, reminiscent of the parable of the Blind Men and the Elephant. Adding to the problem is the assumption made by SO many that if a Mason writes a book, then it is authoritative: this is, simply, false. Only a Grand Master can speak for Freemasonry and then only in his jurisdiction and only during the term of office (generally one year but nowhere in North America more than three years). While an author may write with seeming authority, he does NOT speak for the organization. There are many books and essays written with conclusions with which few would agree, but given great credence by those who do not know better. Because Freemasonry is such an old organization, which has existed in different countries and societies throughout the world, finding a single, complete history or description is impossible. No one, it would seem, could possibly document it all. Although there have been a couple of ‘Masonic encyclopedias’, they are all deficient in their focus and breadth. If you have a particular question or wish to discuss some aspect of Masonry, our Grand Librarian will be happy to help. Having been actively involved in three other jurisdictions before coming to Maine, he is one of only 40 living Fellows of the Philalethes Society (the oldest and largest Masonic research organization in the world), a recipient of the Masonic Brotherhood of the Blue Forget-Me-Not award given to Masonic educators (member #295 since 1990), a Past Master and Fellow of the Maine Lodge of (Masonic) Research, a Founding Fellow of The Masonic Society, and much more. He’s happy to share his knowledge with you and suggest reading material appropriate to your interests. Serving the Fraternity of Freemasons in Maine, their family and friends, and their communities, we welcome you! Hours 8:30-4:30 Monday thru Friday and at other times by arrangement. 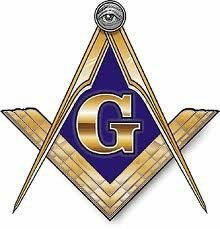 The most common Masonic emblem is the square and compass bounding the letter “G” which alludes to Geometry, one of the seven liberal arts and sciences which Masons are encouraged to study. It has a second allusion, to the Supreme Architect of the Universe.